Telemachus in The Odyssey research papers overview the character in Homer's classic text. Although the bulk of The Odyssey concerns the return voyage of Odysseus from the Trojan War, there is a substantial amount of information that concerns the situation in Ithaca, as the hero’s delayed return causes a crisis. The story of the suitors is well-known, unsavory individuals taking advantage of Odysseus’ absence to live off of the man’s wealth, hoping to gain his throne. However, equally important to the events in Ithaca is the changing relationship between Telemachus and his mother Penelope. In the decade-long absence of his father, Telemachus has grown to manhood. Upset by the situation, he asserts his manhood, forcing his mother to come to terms with his new position as man of the house. Telemachus’ situation is introduced in Book I. Athena, hoping to arrange for Odysseus’ safe return, travels in disguise to Ithaca to “rouse his son to a braver pitch, inspire his heart with courage…and make his name throughout the mortal world”. 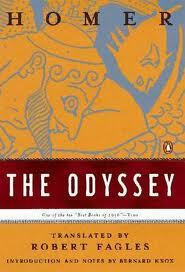 Although it is not said, the son of Odysseus should be as equal a hero in his manhood as the famous father. Telemachus stands poised on the brink of manly greatness, with only a push in the right direction by the gods. think how to drive these suitors from your halls. tell the suitors to scatter, each to his own place. This gives Telemachus what he needs to suddenly assert his rightful place in the halls of Ithaca. He sends his mother to her quarters: “Tend to your own tasks, the distaff and the loom…As for giving orders, men will see to that, but I most of all: I hold the reins of power in this house”. Telemachus is asserting the right of primacy. Penelope has no choice but to acquiesce. “Astonished, she withdrew to her own room. She took to heart the clear good sense in what her son had said”. Paper Masters writes custom research papers on Telemachus in The Odyssey and overview the character in Homer's classic text.